Imagine if you had an easy way to track your business income, expenses, and accounts. 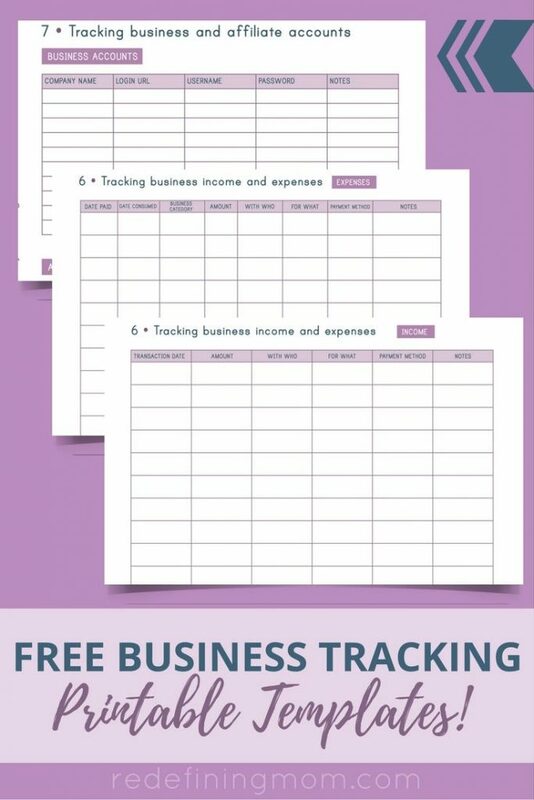 I have three Free Business Tracking Printable Templates to help you get your business life in order! When I started blogging, I couldn’t believe how many accounts I had to open. In the beginning, blogging was just a hobby. I never expected it to turn into an online business. Now that it is a business, I am so glad I kept track of all my income, expenses, and business account information when I started. Regardless of your intentions to turn your blog or online business into a full-time income, it’s important that you track everything from day one. In most places, you have to claim any money you make as income. Can you imagine if you had to go back and separate out every single transaction that was made throughout the entire year for taxes? Not good! Don’t let that happen to you. It’s super simple to keep an accurate log of all your transactions and business accounts that you set up from day one. 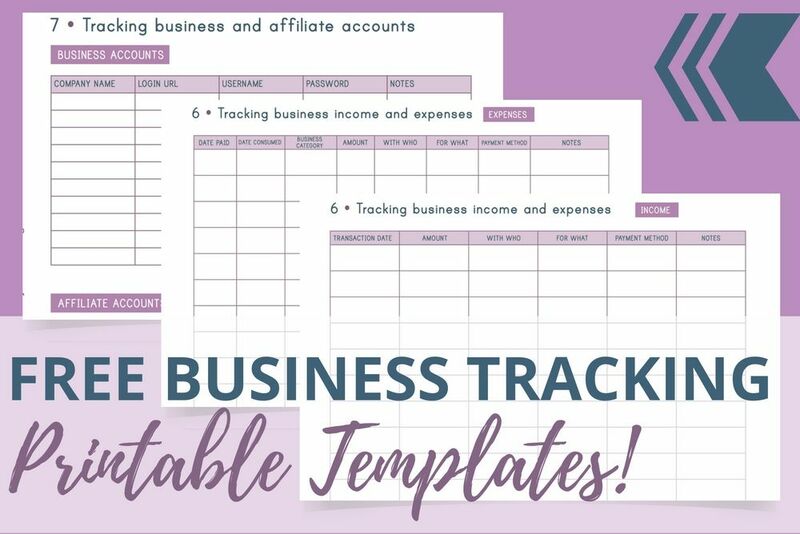 Download these 3 FREE business tracking printable templates to get started! Disclaimer: the advice given below is for informational purposes only and should not substitute for seeking professional advice with someone who is knowledgeable of your specific circumstances and needs. Don’t forget to keep your business income and expenses separate from your personal accounts! Even if you don’t expect to make a lot of money in the beginning or if you are a sole proprietor, it’s still an extremely good idea to keep your business and personal finances separate. Starting your own business, even as a sole proprietor, has tax implications. You will be asked to fill out many W9 forms for things like affiliate marketing payments or client payments. You do not want your Social Security Number (SSN) put out there for everyone to see. The EIN replaces your SSN in business transactions. It’s best to file for an EIN right away. It’s a simple process that can be done online through the IRS. Just use the search box and type: apply for EIN. In most cases, you will need to file for a business license with your County Clerk’s Office. This is especially true if you plan on using a Doing Business As (DBA) name for your business. For example, when I was a sole proprietor, I used Redefining Mom as my business name. I filed a $30 business certificate with my County Clerk’s Office registering the DBA name as Redefining Mom. Since I had already obtained my EIN, I also called the IRS to update my EIN with the DBA name. To learn more about business license requirements in your state, read State Licenses & Permits. Be sure to check with your state/county/town for additional laws related to operating an online business from your home. Keeping your personal and business expenses separate is critical to running a successful business. If you choose to go the LLC route, it will be mandatory. Separating your personal accounts from your business accounts ensures for an easier audit process, should the IRS ever audit you. It also makes it easier to work with a tax advisor or CPA to submit your taxes at the end of the year. Most importantly, it builds credibility with vendors and clients. When you register your business name, you can open up a checking account with your business name on it and write checks as a business. 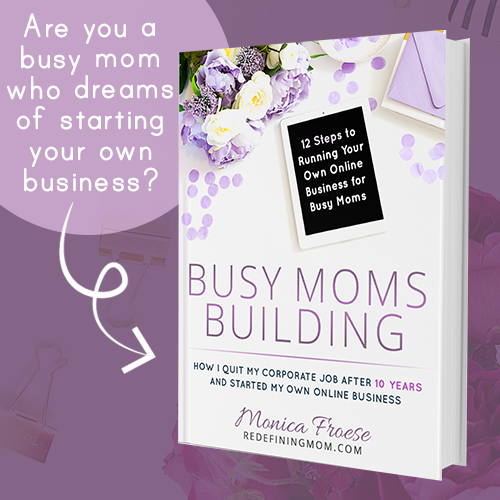 The printables that are available here are templates from the Busy Moms Building workbook! You can get the entire workbook when you purchase the advanced package of my new course Busy Moms Building. Are you looking for more personalized one on one advice? I have one-hour coaching sessions that may be the best fit for you. Thanks for sharing! This is helpful information. I am starting a freelance business and keeping things organized definitely one of those areas that I could use a little help!